Two species are called cumquats in Australia Fortunella maafarita ‘Nagami’ which is a thornless species with rounded fruit. Fortunella japonica ‘ marumi’ has some thorns and the fruit is more oval. An attractive ornamental plant the variegated cumquat Fortunella japonica variegata is also a good fruit producer. This is a ‘sport’ of the ordinary green foliaged plant and has variegation both on the fruit and the foliage. Bushy in growth habit and nice rounded fruits it is an interesting plant for the garden border, but equally at home in a container. Like other types the fruit is used mainly to make jams and preserves but also used in liqueurs such as cumquat brandy. Cumquats are a small evergreen tree or shrub cumquats will reach around 3m in height however are often pruned to a smaller size. Fragrant flowers in spring are followed by small rounded fruits which will ripen in the cooler months, usually late winter. Plants can be standardised, grown as a tree, or even a hedging plant. These are a hardy citrus that cope with cold climates. They do prefer full sun and require a well drained humus rich soil. An all purpose citrus fertiliser applied in spring and again in late summer will keep the plant productive. You can find variegated cumquat grafted onto dwarfing rootstock, excellent for container growing. Try in a tuscan style garden pot for a real Mediterranean look in the garden or on a terrace. Mulch to maintain a cool root run however keep mulch well away from the trunk to prevent rot. In containers water one a week, in the grind water as the soil begins to dry, but ensure good water in spring to summer to enhance fruit production. 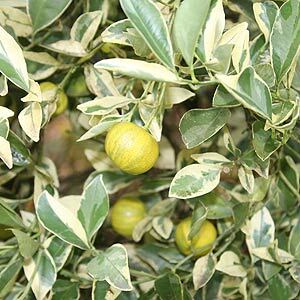 Yellow leaves usually indicated a mineral deficiency, a general purpose citrus fertiliser will help, in alkaline soils some iron chelate can solve the problem. Other issues can be wet soil, so check drainage, especially in heavy soils and container plantings.